If creating New Year's Resolutions seems daunting to you, try this: reframe your resolutions as intentions. Resolutions sound like something you have to do while intentions are something you want to do. I've decided that my intentions for 2019 are: to be more present, carve out more silence in my day and spend more time in nature. These last two I can pair together whenever I take a solo beach walk, hike or any other adventure in nature. About 80% of New Year's Resolutions fail by February. People often set resolutions that are too difficult or don't really believe in the resolution they have set. They've chosen resolutions they feel obligated to choose like exercise more or eat healthier. This year, listen to your heart for a change and set intentions that you'd truly love to stick to. You'll of course need to check in with yourself often and your intentions may change as you journey through 2019, that's ok, too! Let me know how your intention setting goes! I consider myself a patron of the arts. I’m a member of our local museum. My son, whose 10, does at least two art camps every summer at the Santa Barbara Museum of Art. When I have the itch, we go to LA to see more art at the LACMA, MOCA, Hammer and beyond. There is so much incredible art just 90 minutes away. I’ve felt comfortable and at home in art museums ever since I was a little girl. I’m drawn to the quiet. The shhhhhhhhhhh of the guards when you’ve raised your voice a bit too much. The raised finger to lips in the “quiet” position that everyone knows. 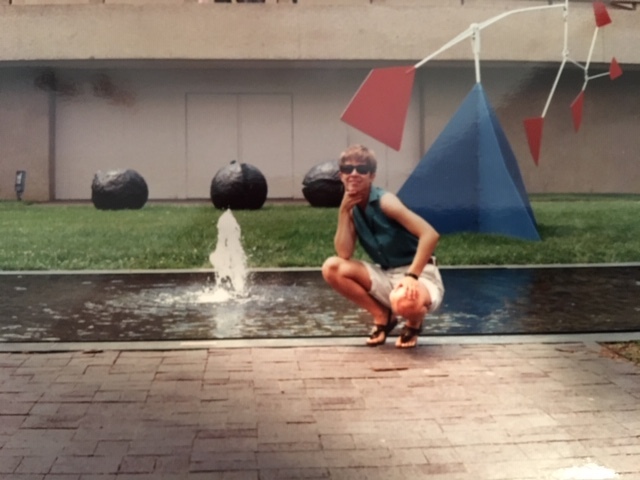 Growing up in DC I was spoiled with the Smithsonian museums as my playground. As soon as we could drive my friends and I would spend the day in the city at a different building (maybe Air and Space or maybe it was an American History kind of day). All the Smithsonian museums are free. Free. FREE. The Smithsonian houses 154 million artifacts, works of art and specimens in all it’s collections. It’s the quiet, most of all, that I’m drawn to in museums. It’s my church. The quiet that lets my brain slow down and think. Think. Think more slowly. Gather my thoughts. Then rearrange them. We rarely make time for this in our lives. If you are seeking out silence, consider swinging by a museum wherever you live (they even have free days) and spend even 20 minutes, I can’t recommend it enough. The quiet. And go a step further and put your phone on airplane mode so you have to be extra quiet. You’ll be amazed at how many great ideas and how clearly you’ll be able to hear yourself think. In this day and age we always want to listen to another podcast, read another book, take in more information. I encourage you to seek out the quiet space that is going to allow you to assemble your thoughts and let your own creativity to flow. If it's not a museum, it could be a hike by yourself, a commute where you don'tlisten to anything, or even just 20 minutes of quiet time in the morning with your cup of tea or coffee. Think of it as freeing your mind. I would love to hear your favorite ways of creating your own quiet space in the comments below. As I was putting my son's Banksy costume away, I realized the New Year is almost here. I was thinking about how overwhelming the end of the year can be for some of us and I came up with a list of pretty small tweaks that you could do that would make your holiday season less stressful. Take some time to do a desk purge. Even 30 minutes can make a huge difference in your work space. Take home the empty lunch containers and jackets that have been piling up. While you’re at it, make a list of the office supplies that have gone low. I’m always more excited to work when I have a fresh pad of sticky notes in a cool color. If you use paper calendars or planners, do you need to re-order the inserts for next year? If so, do it now so you’re not scrambling those first few weeks of January. How do you thank your clients? Do you send out holiday cards? If so, make sure you have a current list of clients to send to and order the cards before the rush. Make tax season less stressful by organizing your expenses now. Whether you have loose paper receipts or use an app for your mileage, even 20 minutes of filing like with like and making sure you’ve input the latest information will save you time in the long run. Make sure you and other family members have your calendars synced. You don’t want to miss an event or holiday party because everyone is not on the same page. Better yet, have a weekly 15 minute meeting every Sunday to prep for the week. When everyone is aware and onboard with the schedule, things will run so much more smoothly. If your family brings gifts into the house during the holidays, why not do a mini-purge now? I like to think of it as less consumption when I can donate clothes, books and toys now to a good cause before more items are brought into the house. It’s not too early to at least make lists for holiday shopping. If your family decides not to do gifts, there are so many great causes to give to, especially local non-profits like See International and Direct Relief. Or maybe your family has decided to forgo gifts for a cool family trip together. Decide now where you’ll go and at least map out the rough itinerary. Do you have any great tips for getting organized before the holidays? If so, I’d love to hear them. If you need help getting organized at home or in your business, schedule a free consultation with me here. I just read a great book that I want to share with you that changed my life. I’ve always loved making checklists but this solidified my love for the super simple, seemingly mundane task. The Checklist Manifesto by Atul Gawande was a New York Times bestseller a few years ago when he published his research on how a simple checklist can save lives, specifically in operating rooms. The simple idea was so groundbreaking that the World Health Organization has adopted the use of checklists in more than twenty countries as a standard of care. Not only are surgeons using simple checklists to save lives, pilots do to. There are take-off checklists and checklists for engine failure. These lists eliminate the guesswork and implement a factor of slow and steady thinking into a world of fast, constant input. I am by no means saving lives with my checklists but for me it forces me to slow down and think through my next steps. For me making checklists has become second nature, especially for travel. If I don’t make a checklist for my trip I will inevitably forget my charger, favorite sunglasses or worse my eye shades for a good night’s sleep. Check out my Inbox Checklist for getting your inbox down to zero in twenty minutes. You’ll feel lighter and leaner and ready to be productive and efficient! Give yourself a Valentine's day present and your brain a break by unplugging for a bit. Neuroscience shows that our brain receives the equivalent information a day to reading 174 newspapers. That's enough to make your head spin. And it does sometimes when we feel a bit overwhelmed. Our brain was not meant to process so much information, so fast, without breaks. Downtime replenishes the brains stores of attention and motivation, encourages productivity and creativity and is essential to achieving our highest levels of performance. There are ways throughout the day that we can give our brain a break and actually bring us back to work more productively and ready to solve problems we might have been stuck on before. Here are a few tips and suggestions for giving your brain that much needed break. Make sure you are getting a good night's sleep. According to the National Sleep foundation, adults need need 7-9 hours a night to feel your best and be most productive the next day. Give yourself mental breaks throughout the day where you completely unplug and let your mind wander. If you can take a walk outside, even better. Neuroscience and psychology research show that mind wandering facilitates areas such as creativity that are important for helping the brain work more effectively. Take time for meditation or mindfulness every day. Even 10 minutes a day can change your brain. According to Harvard neuroscientists, meditation can increase the amount of gray matter in the frontal cortex which is associated with working memory and executive decision making. Don't multi-task or switch task, it makes your brain less productive and efficient. It also divides up your mental resources between tasks and requires your brain to switch contexts for each task you're juggling. It's 2016, now's the chance to start fresh and make realistic resolutions that you will stick to. According to the American Psychological Association, "setting small, attainable goals throughout the year, instead of a singular goal on Jan 1 can help you reach whatever you are striving for". Try to change only one behavior at a time (don't make 10 resolutions all at once). You can gradually add resolutions as the year goes on. Don't beat yourself up when you have a bad day and don't stick to the resolution. This is only normal. Stick to it. It takes 21 days for a new activity to form a new habit so be persistent and patient with yourself. Write them down and track your progress. Keep track of each small success. Short-term goals are easier to keep and each small accomplishment will keep you motivated. Whether you're making personal or career resolutions; with some focus, planning and determination it's possible to make positive changes that will stick in the new year. Most of all, remember to be gentle with yourself. You will no doubt take detours on your path to a new you but when you beat yourself up, you're less likely to brush yourself off and try again. So, choose just one or two resolutions that you'd really love to see become new habits and go for it! And of course, don't forget to celebrate your success.